Cabbage Soup Diet Plan - For Busy Lifestyle! | Sahrish Adeel - Malaysia based Pakistani Beauty & Lifestyle Blogger! 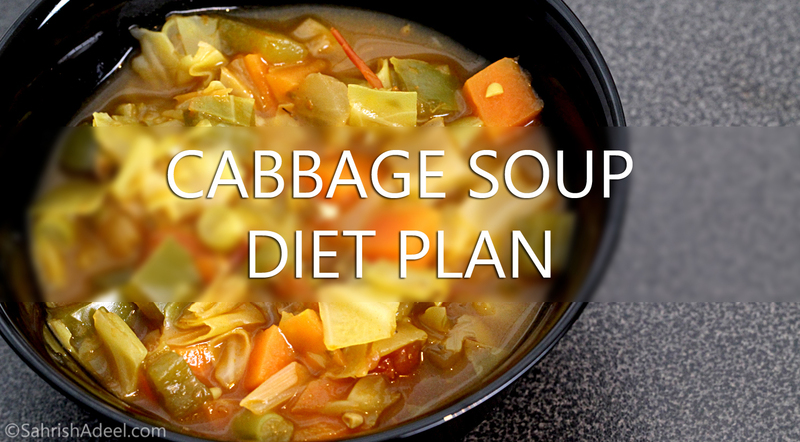 I have seen many variations of Cabbage Soup Diet Plan over the web but with my lifestyle and needs, I made a few changes. I have a family to take care of and things can get jam-packed at times, giving me minimum time to spend on extra things which is why this plan works great for me. Quick disclaimer: I am in no way an expert in diet or nutrition but I have personal experiences with this diet. If you plan to follow this diet plan, kindly make sure that you are in good health or you have consulted with a doctor first. This diet never gave me any side effects so far. Cabbage Soup Diet is designed to give a quick weight loss to people who need some form of surgery and do not have health or time to lose weight, fast. This plan should not be followed for over seven days at one time and should not be repeated for at least two months. You can lose anywhere from 4 lbs to 10 lbs or even more, depending completely on your body. Let's go and see what the diet plan is and in a future post, I will tell you what you can do once this seven-day plan is over. Please note that the weight you lose is majorly the water weight and might not only be the fats but I can tell you one thing, I feel super energetic during this diet and also after it. Literally every time I take high fiber and low carb diet, I feel so much more energetic. Each of the seven days has a different type of food that you can eat, during all seven days of the plan, you are supposed to consume as much of Cabbage Soup as you want and drink plenty of water. You will also see the changes/add-ons I have in this plan. This is not the original plan! Since I cannot start my day without a cup mug of tea, I take a total of 2-3 mugs of tea with low-fat milk and artificial sweetener along with 1-2 Munchy's Vege Crackers with each mug of tea. I have done this diet without tea and crackers and I did not see any huge difference in weight loss except that I was heck lot cranky and grumpy, all day long and it affects my family. You can eat any fruits you want but no bananas at all. I stay away from mangoes and very ripe guavas as well because I feel like they are too sweet for me. Fruits I consume are grapes, apples, watermelon, melon, and oranges. I take my tea and crackers during the day and eat as much Cabbage Soup as I feel like and also, lots of water. I take mostly raw vegetables like; carrots, green and purple cabbages, cucumbers and green corals. I make a huge bowl of salad in the morning so I do not have to do anything for the rest of the day. A simple salad is boring for me so I make my favorite Mint Yogurt as dressing. I grind mint leaves, coriander leaves, a few green chilies and very little salt and mix it with yogurt and a bit of low-fat milk. I make plenty at one time and keep it in the fridge. Two tablespoons of mint yogurt are good enough to add flavor to a large bowl of salad. Do not mix yogurt with salad when you are storing it in the fridge. The yogurt will make the salad loose water and you will end up with mushy vegetables. I take my tea and crackers during the day and eat as much Cabbage Soup as I feel like and also, lots of water. Stay away from corns & peas and other starchy vegetables. You can take a baked potato at the start or end of the day but I do not feel like eating any more vegetables than what I already am eating on this day. Day 3: Fruits & Vegetables! This is pretty much the mix of first two days except for the baked potato. I love to make a smoothy with one orange and one medium-sized carrot with some ice cubes, water a little pinch of salt and black pepper powder. This feels so fresh, is full of fibers and is actually yummy. I love to take it twice on this day. Remember, no bananas or starchy vegetables, especially corns and peas. Day 4: Bananas & Milk! You can only eat bananas on this day with low fat or skimmed milk and low-fat yogurt. I can eat up to 4-6 bananas with about 3-4 glasses of low-fat milk. No sugars! Day 5: Tomatoes & proteins! I eat 5-6 fresh tomatoes on this day. I just cut all of them in cubes in morning and munch on them whenever I feel like. I sprinkle some salt on the tomatoes when I am ready to eat them. This is also the protein day and I like either breast piece of chicken or fish fillets. I pan fry either of these with a sprinkle of chaat masala, soya sauce, red chili flakes, turmeric powder, whole cumin seeds and coriander powder. Eating it with the fork and some tomatoes on side feel like a treat. Stay away from red meats and fatty parts of fish. Day 6: Protein & Vegetables! This is probably my favorite day of all. I make chicken or fish in advance, one day 5 and enjoy it on top of my fresh batch of salad that I made on the second day. I also like to grill chicken fillets without any seasoning at all and enjoy it with Nando's lemon & herb sauce with lots of salad. Day 7: Fruits & Vegetables! The last day is exactly like the third day for me. After two days of protein, I do not mind skipping the meats altogether. I start feeling the result at the end of the very first day and to prove that I am not just imagining it, my weighing scale shows the difference. During all seven days, I weigh my self every morning and night. For first two days, you might feel constipated but on third and maybe four days for some, you can expect a session of diarrhea. This session (a couple of trips to the washroom) did not make me feel exhausted afterward, I actually felt a lot lighter and fresh. I know this might sound like too much information but this is exactly what I went through last time and might go through this time (currently on my third day, stomach feels okay). You should feel a lot more energetic and trust me, first two days might feel difficult but after that, you will feel like you are eating like this all your life. Other than that, you will have loose tops, tummy will feel less prominent and less & less need to stuff yourself as the days go by. Every time I feel like my stomach has shrunk after this diet. I hope I have covered everything in this post. I am currently on my third day and I am keeping a journal for my day and night weigh-ins which I will share after I am done with the diet. My first weigh in on the morning of the first day was 167 lbs. All other updates, I will share in my update post once I am done with the plan. This is most probably only water weight but If I keep my diet healthy and moderate with some form of workout, I should start losing fats in merely a few days. I have lost over 6 lbs with a kick start of Cabbage Soup Diet Plan and then continuing with my other diet plan that I will share in a future post. I regained the weight because I fell sick again and eating healthy or working out was not an option for me. If you have any questions or concerns, please leave them in comments and I will get back to you with the best information I possibly can have. Thank you so much for a huge response and motivation. I hope I will be able to get back to a decent weight and lifestyle, sooner or later. I do not expect quick results but instead, I want to keep it slow but steady. You can find Cabbage Soup Recipe here. If you have any questions, confusions or concerns, do not hesitate to leave a comment or contact me on any of my social networks. You can find me on Instagram & Snapchat with my username; SahrishAdeel. Disclosure: I am in no way an expert in diet or nutrition but I have personal experiences with this diet. If you plan to follow this diet plan, kindly make sure that you are in good health or you have consulted with a doctor first. This diet never gave me any side effects so far.